Shopping for Mike Tyson Mysteries Action Figures? Solving mysteries is what Mike Tyson is all about! 8-inch action figure based on the TV series Mike Tyson Mysteries. The first-ever action figure based on the new series premiering 10/27/14 at 10:30pm ET on Adult Swim! Multiple points of articulation, fabric clothing, and retro 1970s/1980s style. Featuring his signature face tattoo! In the new animated comedy series MIKE TYSON MYSTERIES, Mike Tyson is taking the fight from the boxing ring to the streets … by solving mysteries! Armed with a magical tattoo on his face and a trusty associate by his side — a talking pigeon — if you have a problem that needs solving, Mike is in your corner. 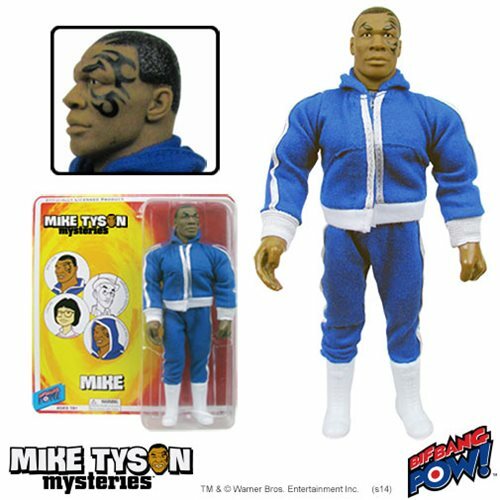 The former Heavyweight Champion of the World comes to the world of toys as this retro Mike Tyson Mysteries Mike Tyson 8-Inch Action Figure from Bif Bang Pow! It's the first-ever action figure based on the series! Featuring Tyson's trademark tattoo on his face, a rich blue and white cloth sweatsuit with hood, and boots, this 8-inch scale action figure is just the thing to keep your desk safe! It features multiple points of articulation, fabric clothing, and a retro style reminiscent of the bestselling action figures of the 1970s and 1980s. Ages 18 and up. MIKE TYSON MYSTERIES: TM & © Warner Bros. Entertainment Inc.